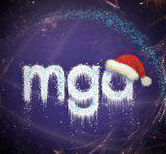 A huge thank you to everyone who left gifts under the MGA tree this year. The staff and the students very much appreciate your kindness. We are very pleased to announce that ‘A Christmas Wish’ raised many many thousands of pounds for Barnardos Scotland.